Concerned about the tough job market that awaits even the most prepared applicants, members of the local Community Education Advisory Board recently held a workshop to help local high school students spruce up their resumes and job applications. 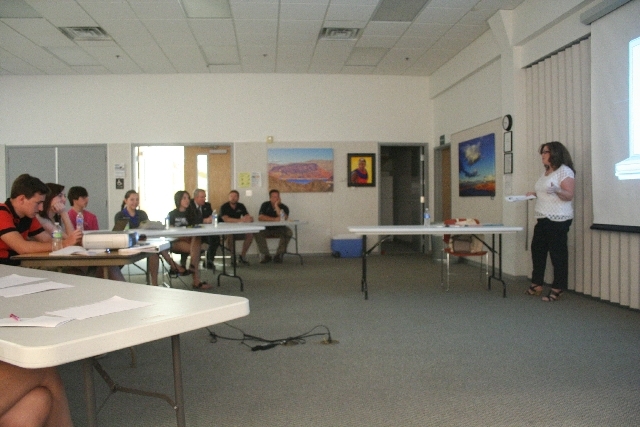 Advisory board President Roxanne Dey hosted the event May 16 at the city library. City Councilman Cam Walker, high school principal Kent Roberts and local business owners were on hand to offer help. The seminar included a free resume review and tips on preparing for interviews, dropping off applications and following up with employers. Twelve students attended the event. Dey, who owns Dey’s Write to Work, said the idea for the workshop came after she heard from students who wanted help finding jobs. Because Dey works full time for the National Park Service at Lake Mead National Recreation Area, spending time with each student who called for help would have been difficult. To complement Dey’s helpful tips, a few local business owners described what they look for from students who apply for jobs. “Several kids shared with me how nice it was for the business owners to share the importance of accuracy and persistence for summer job seekers,” Dey said. He told a story about a woman who came in to fill out an application in clothes that had seemed to be from the night before. She then cracked open a beer she’d brought from elsewhere. Turner then specified the line between annoying and persistent, and the importance of it when applying for a job. Blair Realty owner Chelsea Scheppmann encouraged the students to present themselves as well as they can when applying for a job. John O’Keefe, owner of Senior Group Insurance and Estate Planning, also offered advice to the students. And students Matt Lopez and Paige Robbins participated in a skit illustrating what to wear and not to wear when entering a business to inquire about a job. Dey used Roberts as the business owner. When Lopez, dressed in inappropriate business attire, asked if there were any openings, Roberts replied, “The only one I have is the door and it’s right back there.” The skit aimed to portray how to prepare when inquiring about or applying for a position. Local teens and young adults are entering what some studies believe to be the toughest job market for that age group since the 1940s. Summer employment rates for teens have dropped from 52 percent in the summer of 2000, to 30 percent last year, the study said.